Note to reader (Dec 2013): As mentioned several times earlier (see further down), the original web page, put up back in 1997, has gone a wee bit out of date. But I leave it as a historical relic. In a few hundred years it might be really interesting again! Why I'm revisiting it now is to give long-overdue credit to the hero who raged single-handed warfare against the USPS for the restitution of the Priority Mail Flat Rate mailing envelope. What happened was, back at the beginning of 2011, I mailed off a couple of Jokari sets, as I had been doing for years, in flat rate envelopes - and they were returned! 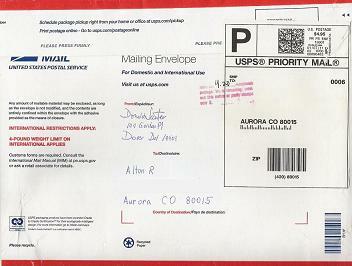 The one to Colorado was marked as needing an additional $4.20 postage on top of the $4.90 flat rate! Ok, nobody's perfect, and mistakes happen, even with the post office. I'll admit, though, this seemed more than a little strange. They had to go to a lot of effort to pull off this goof! 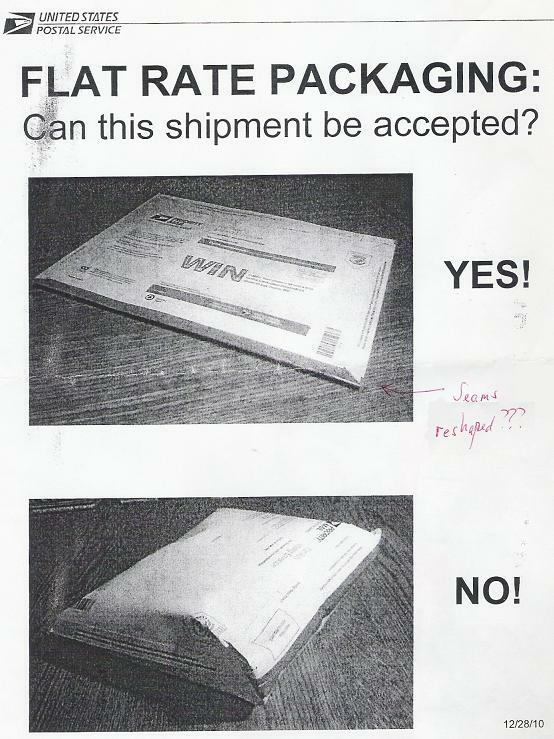 So I take the parcels back to the Dover Delaware post office, expecting them to rectify their error without any fuss, and what does the lady behind the counter do, but reach down and pull out this cheap, ratty photocopy showing that "flat rate" envelopes with something in them can't be accepted! Look! this thing doesn't even have any sort of USPS document number! The photocopy machine smudges you see are strictly original. I can't believe what I'm hearing, so she pulls out a "Retail Standup Talk". Again, nothing in the way of a USPS document number. And isn't that rich: "Retail Associates are to follow the [...] procedures available at: URL GOES HERE". By this time, my mind is reeling. "They're really serious about this? They have a flat rate envelope, but you can't put anything in it???" What really added to the twilight zone-y atmosphere is that there was no hint of an understanding on their part of how bizarre this was; absolutely no awareness of what "flat rate" and "If it fits it ships!" might mean to the normal, intelligent, thinking person who doesn't work for the USPS. I heard from friends that the latter was trumpeted all over tv during the holiday season. Never mind any sort of placating comment or faint apology like, "Sorry, sir, about the rule change. It does seem a little funny, don't it?" She just looked at me like I must be from Mars to think I could mail a flat rate envelope at a flat rate--the way it had been done for years. I yanked the photocopies out of her hand and stormed out. I figured that this mental aberration had to be confined to Dover; maybe some funny fumes were leaking into the post office, or something? When I called USPS customer service, I got the exact same response. They had no idea what I was getting over. The representative I talked to assured me that no other complaints had been received. So I go up the line to Local Consumer Affairs in South Jersey (856-933-4459). I spoke with P. in several phone calls. Again, she had no clue as to what I was getting over. She kept trying to turn things back on me with questions like, "Did I take it to the counter to mail it? ", "Did I get an explanation of why it was returned? ", and, "How far did it get before being returned?" She was adamant, "No, they will not refund the postage." So it all boiled down to some crazy, new postal class that is completely subject to the whim of whichever USPS employee comes across it, whatever "reconfigured", "reshape", and "overstuffed" means to any given postal employee on any given day. Anybody can see that the "YES!" flat rate envelope in the photocopy has "reshaped" seams. And the really crazy thing there is, the sender could have sent that thin stack of paper in a regular manila envelope at the First Class rate for less than $2 - getting the same service, and not having to worry about the mailman returning it for its "bulging" seams! 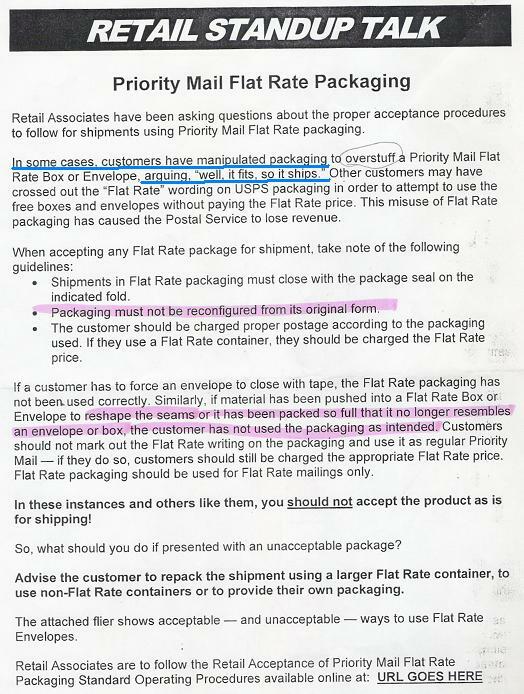 What possible reason for using the Priority Mail flat rate envelope could there be, under these new, under-the-counter, so-called, "guidelines"? Next, I took my case to the USPS Headquarters in Washington DC. They did not deign to respond. Running out of options now... Will I be stuck in this Twilight Zone episode for eternity? "Very recently, our policy regarding Flat Rate mailings has somewhat changed. Our Headquarters believed the information our customers were receiving at the Retail Window was conflicting. 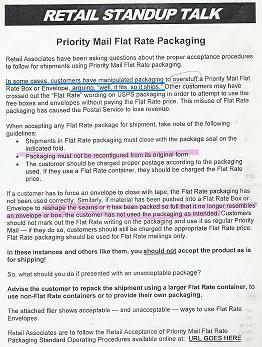 In order to resolve this matter, the acceptance policy for Flat Rate boxes is now more flexible. As long as the contents fit, even though bulky, the mailing is to be accepted. Dover Postal Management contacted Mr. Sauter yesterday and assured him that his mailings would be accepted without incident. If Mr. Sauter has any future postal concerns, please have him contact Dover Postmaster [...] directly. He can be reached at [...]. Please extend our sincere apology to Mr. Sauter for any inconvenience he may have encountered regarding this matter. We appreciate his business and want to keep him as a satisfied customer." I did receive a call from the Dover Post Office, and was told, "You may bulk them. I do apologize for any inconvenience." But, does anybody see anything weird in all of this? Nowhere, in any way, shape, or form, does the USPS admit to having made any sort of mistake here, or even having done anything funny. The letter from South Jersey only refers to resolving the matter of "conflicting information", as if the USPS had nothing to do with creating the conflict in the first place! They pat themselves on the back with, "[Our] acceptance policy... is now more flexible", in breathtaking unawareness that they were simply returning to the way things had been for years before the chintzy "Retail Standup Talk" photocopies popped up a month and a half earlier. It also bugs me that they refer specifically to Flat Rate boxes; the issue was the envelopes, darn it! Anything you put in an envelope distorts it. On the other hand, who would even think of trying to cram a 9-inch bowling ball in a 6-inch box? He was fun to talk with, but even with him, I could not get a whiff of a hint of an admission that the USPS had done anything the least bit strange. I hauled out every analogy I could think of, such as, "Now imagine you work at McDonalds. A customer orders a double cheeseburger from the $1 menu. When he tries to hand you a dollar, you pull out a scuzzy photocopy from under the counter which says McDonald's is losing too much on dollar cheeseburgers, and now they're $2.19. When he starts pointing at the Dollar Menu board on the wall behind you, and jabbering about the big signs pasted on the windows, and the junk mail, and the print ads, and the tv ads, all saying "$1! ", would you just stand there looking at him like he has a hole in his head?" (Note that this was a great analogy back then; I've heard recently that now there are multi-dollar items on the Dollar Menu. It's a funny world...) No, none of this made any impression on the postmaster whatsoever. But at least I had the satisfaction of burning up scores of USPS dollars in this phone chat, assuming that "time is money." So I come on in and fill out Postal Refund Form 3533. This is rarely enough invoked, I think, that it must set off terrorist warning alarm bells. The postmaster himself came out to handle the refund. It took some time, and the line had grown even longer, and I had half a mind to turn to this "jury of my peers" to set the multi-million dollar punitive damages in this case, but figured it was best to let it go at that. You're all welcome. It was nothing, really. Note to reader (Aug 2010): This web page has gone quite out-of-date, perhaps embarrassingly so. You can see from the note below that I viewed it as out-of-date back in Sep 2001. I had deleted it from my web site, but more recently discovered that it is one of the most visited pages of mine on the archival sites, ReoCities and Oocities. Seems nuts to me, but I figure why fight it; maybe there's something to it I don't see. So now it's back again. While I'm at it, here are a few more suggestions for the United States Postal Service (USPS). Please try to understand that it is often the case, perhaps generally the case, that a person wants to know, or must know, the postage of the item he is considering sending before he has the exact address information at hand. This should be very easy for you to accommodate. For instance, if he's thinking of sending something to Idaho, it may be that the postage is the same no matter where it's going in Idaho. If the precise street address and zip code do, in fact, matter, your program would simply return the range of the postage cost. Likewise with weight. Few people are set up to get an exact weight measurement. It would be very handy to be able to input an approximate weight, something like "about 2.5 pounds", say, and have your computer program calculate the postage for that weight, and also for several increments above and below that. 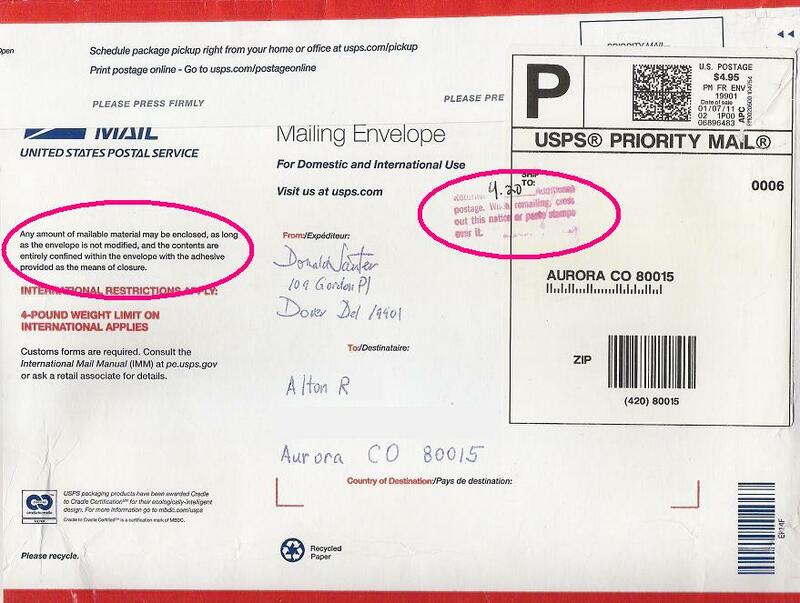 The point is that the difference in postage between 2 and 3 pounds may be negligible, but the decision to mail at all may depend on what the rough, overall postage is. So what I'm suggesting is an option on your web site for a user to simply enter something like: "package; going to Idaho; approx. 2.5 pounds." Then he'll know what the worst case situation is, and there will be no surprises if and when he follows through at the post office. The second suggestion is that you switch over to a series of stamps that mirror U.S. currency in value: $5, $1, $.50, $.25, $.10, plus 5, 4, 3, 2, and 1-centers. I suppose the little ones exist, and maybe the bigger ones, but I propose this set should be promoted as the "basic series" for the USPS. Then anyone could work up the necessary postage for almost any mailing with just a few stamps, as we can pay for any item in a store with just a few pieces of money. Yes, I understand how the postage for a small package, say, is made up of a combination of first-class and extra-ounce rates, but even something like a 5-ounce package, for example, requires 8 stamps (2 first-class + 6 extra-ounce = $1.90, in 2010). It would involve fewer stamps, and be a lot quicker and less confusing, for a person to simply stick on a $1, $.50, $.25, $.10 and $.05. Believe me, it's easy to run out of room on small packages using first-class and extra-ounce stamps. If you went this route, you wouldn't have to shoe-horn your rates into some combination of the first-class and extra-ounce rates, although you would certainly keep stamps with those special denominations available. I implore you to bring stamp machines back to the post offices, and load them with all denominations, and eventually with the "currency" denominations proposed above. If you do this, I will withdraw my plea for a return to old-fashioned, gum-style stamps that you can tear from a sheet or roll in any quantity you want. It is such a pain in the neck peeling up two to six, or more, extra-ounce stamps and affixing them to the envelope one-by-one. And it makes a sloppy appearance, as well. Note to reader (Sep 2001): this web page has gone out-of-date to some extent since it was written. There have been several rate increases since then, terminology for various mail classes has changed, and the USPS has put up a very useful web site. I don't have the inclination to go through the page right now and make all the appropriate modifications. I'll let the original open letter stand for the time being as a testament to the way things were, ca. 1997. But I do have a few more things to say to the USPS. 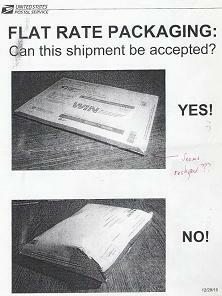 First, I have found out through a friend who is a postal employee that you do not allow flat, rigid items in a letter. I ran a test and sent him a compact disk (without a case) in an envelope. Sure enough, you broke it. I think back to the times I tried to send a computer diskette in an envelope - and they always arrived broken. I attributed it to rough handling; I couldn't imagine your machines were actually designed to destroy thin, flat, sturdy items. This is unacceptable to the point of insanity, or criminality at least. I can't believe your machinery has to be designed so that each and every letter that comes through must be bent. C'mon, everywhere else in the package handling world, rigidity is preferable to floppiness! I suggest that when you redesign your machines, use CDs, computer diskettes, and cassette tapes, all without the cases, in an envelope as test items. (There's an irony here in that cassette and CD cases are much more fragile items than the items they were designed to protect.) Surely, if your machine can destroy items that flat and sturdy, you might as well market it as a trash compactor. Another point is, how come you can't at least tell us what we can't do? Why should the rules and regulations of the USPS be such a mystery? You come to my house every day, why can't you slip a small sheet of things we need to know in my mailbox? You occasionally send out complex, gaudily colored, stamps-by-mail envelopes, so you can't use expense as an excuse. Secondly, I was in a post office a few days ago to buy what I call "extra-ounce" stamps. That seems perfectly clear to me, and I can hardly imagine anything clearer. In fact, I thought I had gotten the term from the USPS itself somewhere along the line, although it always stymies postal clerks. In this case, I tried to clarify myself by saying, "you know, 21 cent-ers." That's risky, because I always have the darndest time trying to remember which is the post card rate and which is the extra-ounce rate. After much discussion with the clerk, to the point that I was feeling very bad for the people in line behind me, she finally got it through my head - very politely - that the stamps I wanted were now 23 cents - that the rates had gone up July 1 2001. Point no. 1: How could I have been kept unaware of the rate increase? As argued above, you come right to my door every day- and you can't slip a flimsy little sheet of new postal rates in my mailbox??? It's not like you don't have a direct line of communication with your customers - I can't think of a business with a more direct line! Point no. 2: After almost 3 months the post office still had not gotten in any of the stamps of the new denomination!!! (They didn't have any of the old, either. Am I the only person who uses extra-ounce stamps? How come they're not loaded in your vending machines?) It's not like your own rate increases take you by surprise. Can't you time them with the availability of the new stamps? Point No. 3: This is more idealistic than the two specific points above. You always give the impression of being in serious trouble - the rate increases are coming faster and furiouser than ever. You might want to have a talk with your employees about greed. Let them know that, sure, you'll give them everything they demand for their cushy jobs, but that when the whole thing collapses there won't be any money or any benefits for anybody. Anyhow, that's all changed now. In August 2001 I sent my mother an envelope which never got to her. It only had to go from a Washington DC suburb up to a Baltimore suburb. It contained an old and somewhat treasured document that I had borrowed. I know the letter was addressed correctly. I know the address was printed in block capitals. I know I stuck on a preprinted return address label. I know it never got there. My world was altered forever. Then my mom told me she had recently sent a check to my sister in northern Virginia which never got there. My mom is a long-time letter writer, and I know her addresses are more legible than any machine-printed ones. And then it occurred to me, in the previous 5 months two of my gas bills never came. Maybe one you could blame on a glitch at the utility, but two??? And then it occurred to me, my sister told me she never got the letter I sent to her in Florida the previous Christmas (2000). And THEN it occurred to me, how come in the 20 years I've been living here, I've happily hand-delivered mail dozens of times to other households in the neighborhood which was dropped off at my house by mistake - but no more than 2 or 3 times have neighbors brought my mail that got mixed in with theirs? Just how much of my mail is being pitched into neighbor's waste baskets? Note that all of these incidents predate September 11, 2001 and can't be blamed on that. My confidence in the US Mail has taken a terrific beating and now my heart jumps up into my throat whenever it comes time to release my grip and let a letter drop into a mailbox. First of all, a compliment: I find your delivery to be extremely reliable and more-than-speedy enough for my purposes. The cost is not yet outrageous, but I'm afraid it's heading that direction. We used to be Number 1. Then you were reduced to gushing how few countries had cheaper rates than us. It won't be long before you're bragging that U.S. postal prices are "within the top 50% of all nations!" Whoopee. My big complaint is that you do a poor job of communicating in plain terms what services you offer - and that's putting it very gently. I devote a Web page to the matter because of the unbelievably, stupendously, breathtakingly bad job you do. World class. Absolutely staggering. Phenomenal. Mindboggling. Simply amazing. How hard can it be? You only offer a tiny handful of services. Compare that with other companies which offer perhaps hundreds of products. I challenge you to a surprise quiz. Close your books and take out your pencil. Here are some mail classes. Which are equivalent? Which are subcategories of which others? Go. Time's up. Anyhow, you're off the hook. I can't grade your quiz because I don't know the answers myself. I don't feel stupid because your employees can't sort it out, either. I know some. the computer at the post office shows Book Rate. This is either the same thing, or at least has the same pricing, so that's ok. The only damage derives from my need to make sense of things. But that's if I'm lucky. More often than not, some class pops up on the computer which costs a lot more than the Special Standard Mail. I always bring a load of USPS publications to show the clerk the price I had expected. I doubt many people go to that trouble and are completely at the mercy of your computers and your employees' key-punching fingers. Notice that this rant hasn't even touched on the more important question of what kind of items can be mailed in each class, and how the various classes compare with respect to delivery time, and what happens in case the piece is undeliverable. Once I went to mail a packet of newsletters in a big envelope via Special Standard Mail. The computer showed Book Rate. The clerk yanked out one of the newsletters and declared it wasn't a book. Sure seemed like a book to me, and, moreover, what should it matter since I was just mailing a generic package Parcel Post? The point is, could you please wipe the slate clean and devise useful classes with reasonably descriptive names? What I as a consumer need to know when I want to mail something, anything - a package containing a book, bottle of shampoo and a letter, for example - is what options are available to me. Then I will make a choice (if there are any) based on price and projected delivery time. Also, USPS publications heap on everything you've got to offer - both business-type classes and normal-people-type classes. Why not produce separate booklets so the masses don't ever have to stew over whether they can mail something Second Class or Library Rate, etc.? A few definitions of your acronyms and jargon (for example, Intra-BMC, ASF, zone) right in the publication that uses them would be greatly appreciated. This isn't asking for too much. On a different topic, do you know how hard it is for the common man to come up with the Zip codes that are oh-so-important to you? In the past, I have had very poor luck using the phone number for Zip codes under USPS in the phone book. (Perhaps that has gotten better now.) Even my local post offices don't have Zip code directories available to the public. One would almost think that Zip codes are classified information. Buying the big, fat 2-volume set for the whole U.S. does not make sense for the typical person. My suggestion is this. Team up with the local phone company to include a complete, local Zip code directory in every white-page phone directory. This only makes sense, since the phone directory provides the rest of the mailing address. How many pages could it take? Local Zip code directories are all that people would generally need. If you are mailing something out of your area, you almost certainly got the Zip code along with the address you are mailing to. If for some reason you dug the address out of a non-local phone book, well, there would be a Zip code directory right in that phone book. That's all that comes to mind right now. Thanks for your consideration.